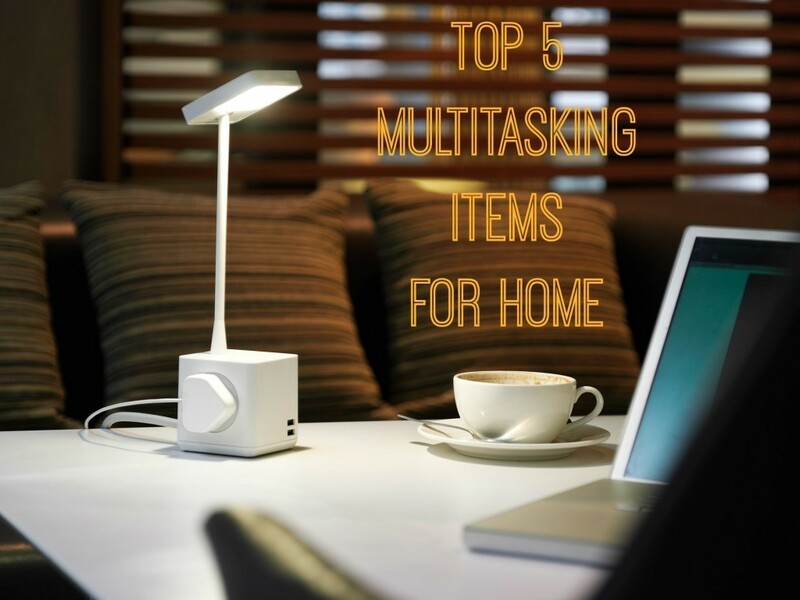 Top 5 multitasking items for your home! Being a very busy mum, wife, a homemaker and a blogger, I understand the value and importance of timekeeping and being well-organised. Having a tight schedule compelled me to juggle many activities simultaneously and thanks to that I have just about perfected my organisational skills. Having said that, just as every other home décor lover I do like the idea of versatile accessories. They not only make interiors look more beautiful but also save space at home by combining several functions into one item. I have collated a list of items that I would love to see at my home as they are practical, compact, visually stunning and most importantly help me multitask! This accessory is amazing and it’s at the top of my wish list. Cubert is a UK-design and a nifty little device that combines mains sockets with USBs and an LED lamp that is guaranteed to shine a bright light for up to 50,000 hours. It is elegant and minimalistic which means it can fit into any interior without imposing on the design of any given space. The best thing about Cubert is that you can charge multiple devices at once. It supports all of the current technology such as smartphones, tablets and every kind of a laptop so kids and hubby would want to use it too! Cubert also lets you use it as a main source of power for your curling tongs and a hair straightener (but be careful of not exceeding 10 amps!) so that clever little lamp would make a perfect space at your dressing table. What I like the most about Cubert is its versatility, putting it on a bedside or coffee table allows you to use it as a light to read a book whilst charging all your electronic devices. 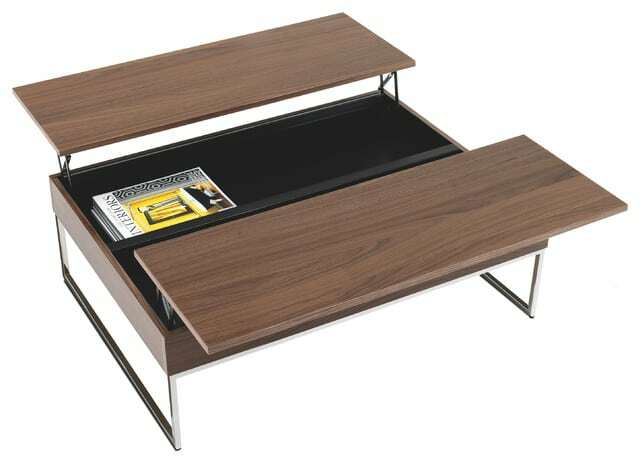 If you’re looking for a great product to put the Cubert lamp on, look no further than the Granville coffee table! It is elegant, stylish and most importantly functional. It comes in beautiful chestnut colour and in addition to being a coffee table it can be used as storage space and turned into a dining table when the space is limited. It’s fabulous for a dinner party when more guests arrive or simply when you want to snack in front of the telly! What an ingeniously designed piece of furniture. 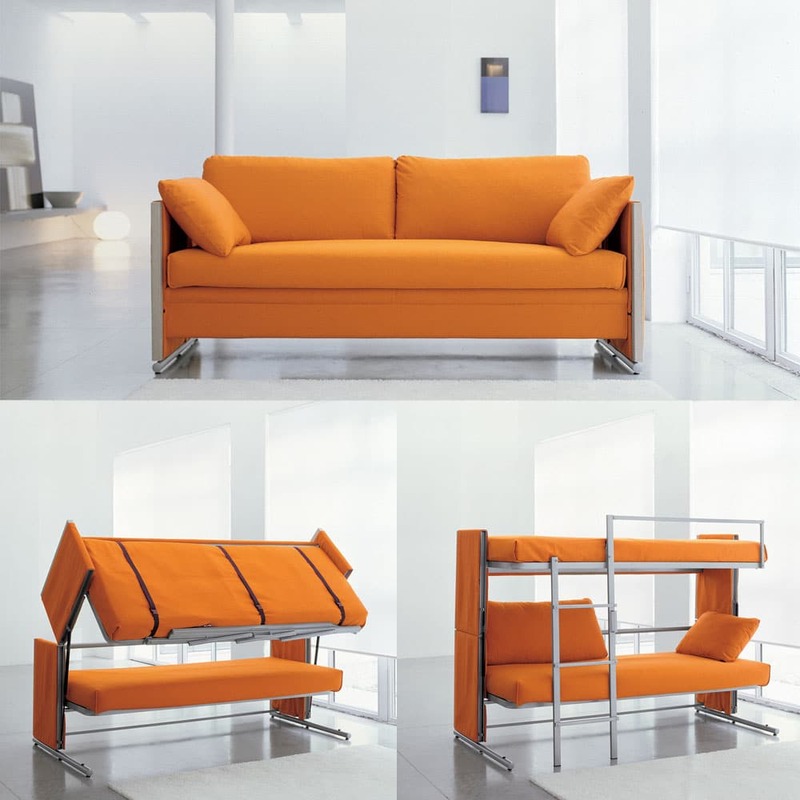 It is a unique sofa in a vibrant orange colour that converts into a bunk bed. Also what a fantastic space saver this is! It’s great for having guests staying over or for kids sharing a bedroom. 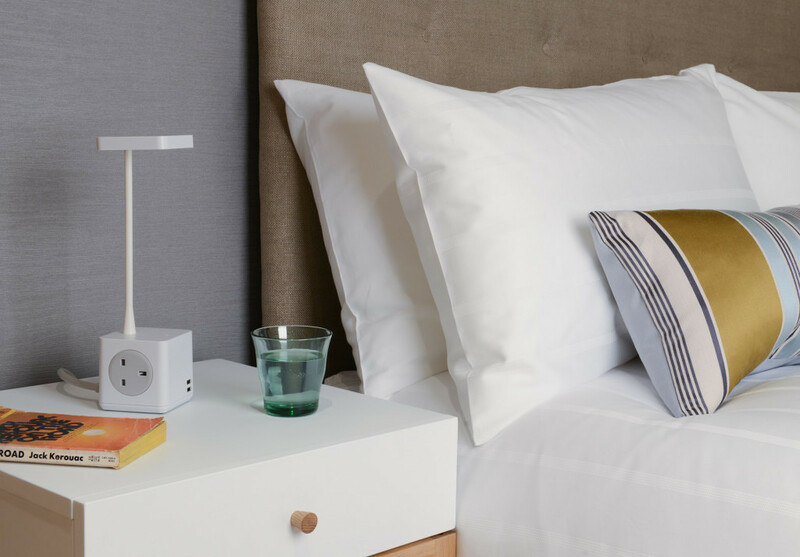 The only downer is the price – it costs £3k – however having combined different furniture pieces into one can save that extra budget that would have been otherwise spent on an additional sofa and a bed in the guestroom. This item is a unique combination of a bike rack with a shelf for the sport and the design conscious. You can lift your bicycle up above the floor so it saves space and dirty marks on your carpet. It allows you to keep organised by keeping all your cycling gear with your bike in one place. Moreover, it has hooks so you can hang your coats and jackets and it looks great with or without the bicycle on it. Handmade from natural wood it will complement your interiors beautifully! 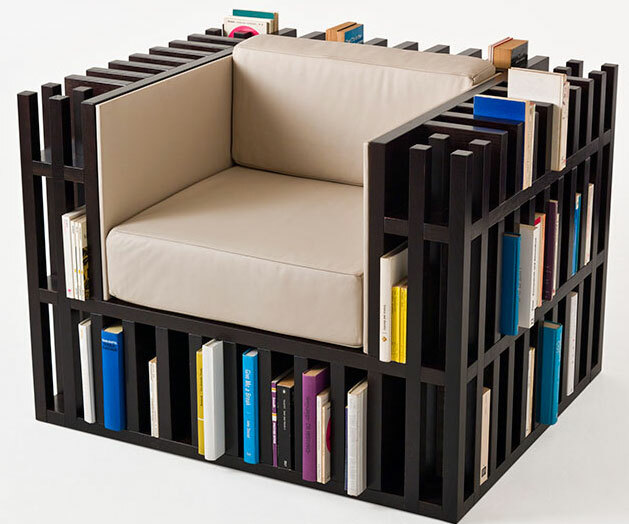 Bookcase chair is self-explanatory, it combines space for storing your books with a place where you store your bum! Quite handy for bookworms that don’t want to move away from their seat when finishing a book and starting another! What I like about this chair is how sleek and stylish it would look in my home, giving my rooms a ‘library’ look and feel. These are premium items that would make a bold statement at your home. Particularly as Christmas is fast approaching it would make a beautiful present for yourself or you’re the loved ones! Thank you so much for sharing these interesting ideas with us. I never knew that I could use my bike as a stand! You know, I wonder if men multitask as much as we women do. It seems to me that my husband does one thing at a time without any consideration of all the other things needing to be done, whereas my mind is running riot with all the things I am doing! 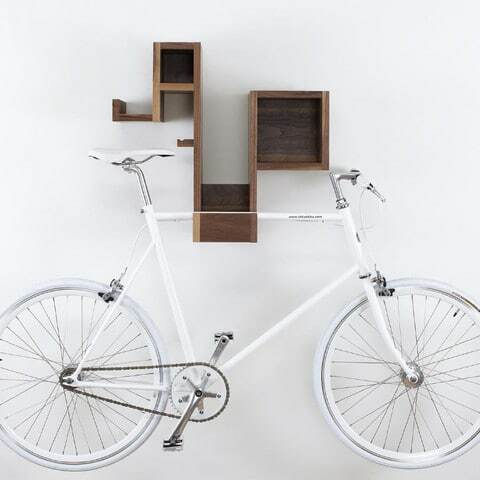 I’m loving the look of that bicycle shelf! Home » Home and Interiors » Top 5 multitasking items for your home!